International Cardiovascular Research Journal - Morphological and Tissue Alterations in One Papillary Muscle: An Early Sign of Hypertrophic Cardiomyopathy? Morphological and Tissue Alterations in One Papillary Muscle: An Early Sign of Hypertrophic Cardiomyopathy? To Cite: Cresti A, Aquaro G D, Picotti A, Kocabay G, Todiere G. Morphological and Tissue Alterations in One Papillary Muscle: An Early Sign of Hypertrophic Cardiomyopathy?, Int Cardio Res J. Online ahead of Print ; 10(4):e9818. Isolated papillary muscle (PM) hypertrophy has been supposed to be a phenotypic variant of hypertrophic cardiomyopathy. Whether this finding may explain an electrocardiographic pattern of left ventricular hypertrophy has to be demonstrated. A cardiac magnetic resonance imaging may add additional crucial information. Our case was a 26-year-old asymptomatic male cyclist who underwent routine sport medicine screening. His cousin had suddenly died during a bicycle race at 40 years of age, and autopsy had revealed a hypertrophic cardiomyopathy. Screening revealed an electrocardiographic pattern of left ventricular hypertrophy. A multimodal imaging examination was also performed and the only abnormal finding was a hypertrophic anterolateral PM and cardiac magnetic resonance imaging showed fibrotic substitution of its head. An otherwise unexplained electrocardiographic pattern of left ventricular hypertrophy can be justified by an isolated PM hypertrophy. Cardiac magnetic resonance imaging is crucial for precise ventricular wall and papillary thickness measurement. In the presence of an isolated PM hypertrophy, post-gadolinium T1 mapping can demonstrate the presence of abnormal tissue and probably fibrosis of the papillary head, which can confirm the presence of a strictly localized form of hypertrophic cardiomyopathy. Isolated papillary muscle (PM) hypertrophy is characterized by an asymmetric hypertrophy of one PM without hypertrophy of the left ventricular (LV) walls. PM hypertrophy, defined as > 11 mm diameter of at least one of the two PMs (1), has been recently identified as a phenotypic variant of hypertrophic cardiomyopathy (HCM) (2, 3). Apical displacement of a hypertrophic PM may be confused for an apical variant of HCM (4, 5). Among the cardiac imaging techniques, echocardiography is the first-line screening exam when pathology may be suspected during cardiovascular screening in athletes, as in the case of an abnormal electrocardiogram. In this setting, cardiac magnetic resonance (CMR) imaging is a more accurate imaging technique due to its superiority in depiction of cardiac anatomy and evaluation of tissue alterations, such as fibrosis (6). Absence of normal muscular tissues may be identified by late gadolinium enhancement (LGE) sequences. CMR measurement of wall thickness is more accurate and is essential for diagnosis of a PM hypertrophy. 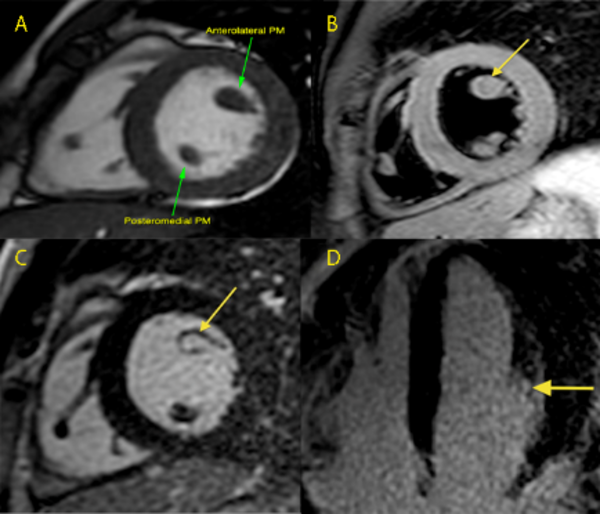 Herein, we report a case of structural, morphological, and tissue anomaly of one PM shown by echocardiography and CMR imaging techniques, such as LGE and post-contrast T1 mapping. A 26-year-old asymptomatic male cyclist underwent a cardiac screening in order to obtain eligibility for competitive races. His cousin had suddenly died during a bicycle race at 40 years of age, and autopsy had revealed an HCM. Review of his health records showed an electrocardiographic pattern of LV hypertrophy (LVH) and a large muscle bundle inserted in the interventricular septum. This condition has recently been recognized to represent an additional morphological marker for HCM diagnosis (7). Physical examination and routine biochemical parameters of our patient were normal. Besides, 12-lead electrocardiogram showed normal sinus rhythm with LVH criteria and T wave inversion in leads V4, V5 (Figure 1, left panel). Transthoracic 2-D echocardiography also revealed normal LV systolic and diastolic function, normal LV wall thickness, and normal Doppler findings, but a hypertrophic and hyperechoic anterolateral papillary muscle head was suspected (Figure 1, right panel). For precise evaluation of the mitral valve apparatus and the LV Wall thickness, CMR imaging was performed. The exam revealed normal ventricular volumes, while the LV mass index (104 g/m2) had slightly increased as the patient was a highly trained cyclist. The head of the anterolateral PM was 11 mm in diameter (Figure 2, panel A). Neither displacement of the muscles nor any accessory PMs were present. At T2-weighted-STIR, the head of the PM showed no significant differences with the myocardial walls regarding signal intensity (Figure 2, panel B). LGE was also performed 10 and 20 minutes after contrast administration and the head of the PM showed the same hyper-intense signal as the blood pool (Figure 2, panel C-D). Additionally, post-gadolinium T1 mapping performed 15 minutes after the contrast media injection showed that the PM head had different nulling time compared to myocardium, fat, and cavity, thus suggesting the presence of a pathological tissue. The anomalous signal of the PM head could not be definitely attributed to scar or other pathological tissues, such as lipomatosis or a tumour; rather, it could be more likely due to fibrosis. A biopsy would be the only way to make a definitive diagnosis, but it was not performed due to the high risk of complications. The family history together with the electrocardiogram and echocardiographic and CMR imaging findings suggested the diagnosis of an HCM variant strictly localized to one PM. The patient was therefore advised to avoid competitive sports. Figure 1. 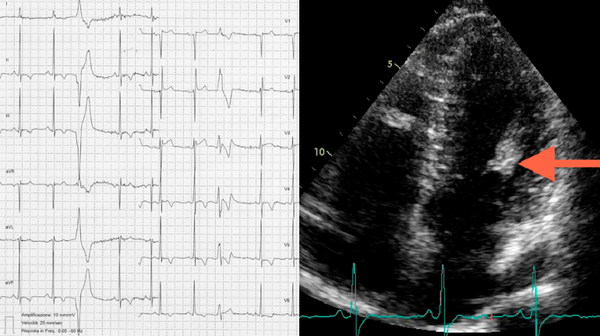 Left panel, electrocardiogram; Left ventricular hypertrophy with t-waves inversion in the inferior and lateral leads and ventricular premature beat; right panel, echocardiography; Apical 4-chamber views showing the hypertrophic and hyper-echoic anterolateral papillary muscle. Panel A, Steady state free precession still image, short axis: the head of the anterolateral PM is mildly thickened and the asymmetry of the size of the papillary muscles head is evident; Panel B, T2-weighted black blood sequence, short axis view: no signal differences between the papillary muscles head are detectable with this sequence; Panel C, late gadolinium enhancement sequence acquired ten minutes after contrast injection, short axis view; Panel D, late gadolinium enhancement sequence acquired ten minutes after contrast injection, 4-chamber view; The focal hyper-intense signal of the anterolateral PM head (arrows) indicates substitution of the normal muscle with pathological tissue. An LVH electrocardiographic pattern in the absence of thickened ventricular walls could be due to an isolated PM hypertrophy. Morphological and tissue abnormalities in PMs, such as anomalous insertion, hypertrophy, accessory muscles, displacement, and direct insertion into the anterior mitral valve leaflet, are not infrequent findings in patients affected by HCM. Isolated PM hypertrophy with normal wall thickness could be a rare phenotypic expression of HCM. Isolated PM hyoertrophy has been reported as the only morphological abnormality in the early phase of HCM, and it has been suggested that these changes may evolve along with progressive hypertrophy (8). Our case highlighted the importance of PM evaluation during the echocardiographic exam. In such cases, the sonographer should look for PM dimensions and echogenicity. The upper limit of normality of a papillary head was proposed by Kobashi (1) who studied 40 normal subjects. Accordingly, the diameter should not exceed 11 mm in the short axis view. However, large-scale datasets are limited in the literature. In our patient, the diameter of the anterolateral PM was 11 mm (not exceeding the upper limit) although a disproportion was clear compared to the posteromedial PM. One of the messages emerging from our case is that not only the size but also the echogenicity of the PM should be examined. In any case, when the papillary head looks abnormal or atypical, thickened, and/or hyper-echoic, a CMR exam should be performed. CMR imaging, with its higher spatial resolution, can confirm the hypertrophy, assess left and right ventricular mass, volumes, and function, evaluate the anatomy of the mitral apparatus, and determine the presence of outflow tract obstruction (9). LGE and post-contrast T1 mapping also allow identification of isolated PM fibrosis (10), which may be an early form, although atypical, of HCM even in the absence of a clear hypertrophy of the muscle itself. This finding may carry important implications for HCM screening. Authors’ Contribution: Study concept and design: Alberto Cresti; acquisition of data: Alberto Cresti and Alberto Picotti; analysis and interpretation of data: Alberto Cresti and Alberto Picotti; drafting of the manuscript: Alberto Cresti and Gonenc Kocabay; critical revision of the manuscript for important intellectual content: Alberto Cresti, Giovanni Donato Aquaro and Giancarlo Todiere; statistical analysis: Alberto Cresti and Giancarlo Todiere; administrative, technical, and material support: Alberto Cresti; study supervision: Giovanni Donato Aquaro. Funding/Support: There is no support. Implication for Health Policy/ Practice/ Research/ Medical Education: An electrocardiographic pattern of left ventricular hypertrophy in presence of normal wall thickness, should raise the suspicion of a variant or early form of hypertrophic cardiomyopathy. In such cases the measurement of the diameter of the papillary muscles head is mandatory in order to exclude an isolated hypertrophy. The cardiac sonographer should look at the papillary muscles echogenicity. A hyperechoic papillary muscle, even in the absence of a clear hypertrophy is an important suspicion finding and a consequent better tissue characterization with cardiac magnetic resonance is crucial. T1 mapping and post-contrast delayed enhancement magnetic resonance imaging, allow accurate identification of subclinical abnormalities of the papillary muscles that may represent early signs of hypertrophic cardiomyopathy.